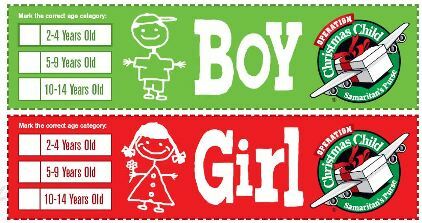 Operation Christmas Child labels will make certain your Christmas shoebox gets into the hands of the person you packed it for. Samaritan’s Purse makes divisions for the boxes according to both gender and age. You’ll notice on the labels that the age divisions are 2-4 year olds, 5-9 year olds, and 10-14 year olds. Try to go with the age group you feel most comfortable with buying for, or better yet, take some children who fit in those age ranges with you. They will know exactly how to help! It’s also fun to include a letter and a picture of yourself and your family before you close your box and put the lid and label on it. Did you know you can make your shoebox donation online and learn about the country where your gift is going? Discover how to follow your box and track your shoebox’s journey HERE. Find the FREE downloadable labels HERE. Just print them off, fill them out, and tape to the outside of the lid of your box. When your box is ready, take it to an Operation Christmas Child drop off center. Do you know when Collection Week is? Find out HERE on Faithful Provisions. Please send us 30 shoe boxes labels for Operation Christmas Child boxes. Have a bless day!!! Could you please send me 30 labels for samaratian’spurse shoebox labels? Could you send samaritian’s shoebox labels to me gor our church? I am not the only one confused about how to get the boy/girl shoebox labels. I need 225 for our church. Can you ship to me? I would like some box labels but can’t find anyplace to order them! I clicked on the site for printable labels, but it says the site is not working. Can you please help me find a place where I can print a whole page of the labels instead of printing just two at a time? Thanks!! I saved the above as a pic and put into a Word document. I manipulated–landscape and turned to get six labels on a 8.5 x 11 sheet. How do I print labels to send shoe Boxes?